Car Rental in Maui: Should You Drive to Hana via the Southern Route? Have a Car Rental in Maui... Should You Drive the Southern Route to Hana? I think this is one trip that a lot of folks getting a car rental in Maui would like to make part of their Maui, Hi vacation. Especially if you plan on driving the Road to Hana, I'm sure you've considered whether or not you want to just continue the drive past Hana all the way around the southern part of the island. But, rental cars in Maui are often forbidden from driving this route. When researching this drive ahead of time, I'd heard reports varying from "It's an easy drive!" to "Don't do it! It's dangerous!" So what was I to believe? Despite these conflicting reports, this was a trip that I really wanted to include in our Maui, Hi vacation. The fact that this route is forbidden territory in many car rental contracts definitely piqued my curiosity all the more - I really wanted to experience this drive for myself! So how did we travel this southern route to Hana without using a car rental in Maui? We ended up signing up with a tour company for a hike up the Pipiwai Trail (near Hana). This tour included our guide picking us up in central Maui, and driving us out to the trailhead via the southern side of the island! It was the perfect solution. Our guide had lots of experience in driving to Hana via the southern route, thus making it much safer compared to attempting it on our own! As we made our way along the southern coast of Maui, we found the scenery to be beautiful and varied. We passed tranquil fields filled with tall grass, dried lava flows, and lush jungle. Since much of the highway was within site of the ocean, we got to see that too! I don't know about you, but I'll take all the ocean views I can get! Here's a pic that we took from the shoulder of the road. 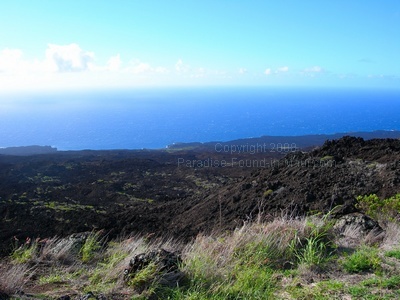 The rich black of the hardened lava rock contrasts beautifully with the deep blue of the ocean - I just loved this view! But enough about the views... time to get to the issue of safety! Should you attempt this drive on your own? Our experience with this route was that most of it was quite safe and would put very little wear and tear on a car rental in Maui. Other parts of this route are gravel, and therefore have the potential to get quite rough... especially if there are a lot of potholes after heavy rains. 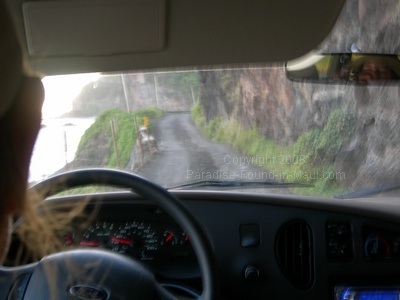 But as you approach the south-east side of the island, driving to Hana via the southern route can be downright scary! There are portions of this road that appear as though they were literally carved into the cliffside. In the worst areas, the road is only a single lane with no shoulder, hugging the vegetation-covered cliffs, waves crashing far below, and blind corners. Awesome scenery... but scary. Oh... and did I mention the risk of rockslides? You'll notice that the road is really only a single lane here - if you see any oncoming vehicles, one of you will have to find a place to pull over to allow the other to pass. So, now that I've experienced this drive, would I use a car rental in Maui to go it alone? I would not use a car rental in Maui to drive the portions of this route that are prohibited in the rental contract - it's just too risky in my opinion. In addition to safety issues, there are financial considerations in the event you got into an accident... would the insurance still cover you if you were driving in an area expressly forbidden in your rental contract?... if not, an accident could cost a lot more than any of us had bargained for! Also, I don't like the idea of driving in a place that is so isolated, and that we as tourists are unfamiliar with (compared to locals!). As we drove this southern route to Hana, we only passed a handful of cars. If we had attempted this drive in our own car rental in Maui, I would have been worried about what we would do if our car broke down... or what if we had an accident? I couldn't help but feel reassured by the presence of our guide, who would know exactly how to handle such a thing in this isolated area. That being said, since the first portion of the route is fairly easy driving (ie. assuming you are starting your drive from central Maui), I would still consider driving THAT part on my own. It wasn't forbidden in our car rental contract, and the paved portion of the road was in good shape. BUT, if I were driving this route on my own, I'd turn back once the highway turns to gravel.